Nicaragua is a country in Central America. It is officially called the Republic of Nicaragua (Spanish: República de Nicaragua). It has a size of 129,494 square kilometres. 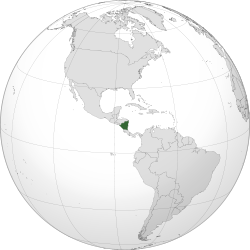 It is the largest country in Central America. It borders Honduras to the north and Costa Rica to the south. The capital of the country is Managua. Managua is the third-largest city in Central America. It is also the biggest city of Nicaragua. Almost a quarter of the population lives in the capital city. The population of Nicaragua is approximately 6 million. The population is multicultural. The population includes indigenous native tribes from the Mosquito Coast, Europeans, Africans, Asians, and people from the Middle East. The main language is Spanish. Some native tribes on the eastern coast speak their native languages. Some of these languages are Miskito, Sumo, and Rama. Some people speak English Creole. The mixture of cultures has created diversity in art and literature. Some famous Nicaraguan writers are Rubén Darío, Ernesto Cardenal, and Gioconda Belli. The biological diversity, warm tropical climate, and active volcanoes make Nicaragua an increasingly popular tourist destination. ↑ "Nicaragua Demographics Profile 2011". Nicaragua. Index Mundi. 2011. http://www.indexmundi.com/nicaragua/demographics_profile.html. Retrieved 2011-07-16. ↑ "Población Total, estimada al 30 de Junio del año 2012" (in Spanish). National Nicaraguan Institute of Development Information. pp. 1–5. http://www.inide.gob.ni/estadisticas/Cifras%20municipales%20a%C3%B1o%202012%20INIDE.pdf. Retrieved 24 March 2013. ↑ 4.0 4.1 4.2 4.3 "Nicaragua". International Monetary Fund. http://www.imf.org/external/pubs/ft/weo/2013/01/weodata/weorept.aspx?sy=2011&ey=2018&scsm=1&ssd=1&sort=country&ds=.&br=1&pr1.x=53&pr1.y=8&c=278%2C283%2C128%2C944&s=NGDPD%2CNGDPDPC%2CPPPGDP%2CPPPPC%2CLP&grp=0&a=. Retrieved 2013-05-23. ↑ United Nations Development Programme (2013). "Table 1: Human Development index and its components". Human Development Report 2013 The Rise of the South: Human Progress in a Diverse World. New York: United Nations. http://hdr.undp.org/en/media/HDR_2010_EN_Tables_reprint.pdf. Retrieved 2011-07-16. ↑ "Nicaragua, Eternal Land of Poets". Elcomercio.pe. http://translate.google.com/translate?js=n&prev=_t&hl=en&ie=UTF-8&layout=2&eotf=1&sl=es&tl=en&u=http://elcomercio.pe/edicionimpresa/Html/2008-01-20/nicaragua-eterna-tierra-poetas.html&act=url. Retrieved 2010-06-26. ↑ Dicum, G (2006-12-17). "The Rediscovery of Nicaragua". Travel Section. New York: TraveThe New York Times. http://travel.nytimes.com/2006/12/17/travel/17Nicaragua.html?ref=travel. Retrieved 2010-06-26. ↑ Davis, LS (2009-04-22). "Nicaragua: The next Costa Rica?". Mother Nature Network. MNN Holdings, LLC. http://www.mnn.com/lifestyle/eco-tourism/stories/nicaragua-the-next-costa-rica. Retrieved 2010-06-26. This page was last changed on 20 October 2013, at 01:55.